GAME NOTES: THE TIGERS (21-0) CAME INTO THE OHSAA TOURNAMENT RANKED #1 IN OHIO AND AS ONE OF THE MOST POTENT OFFENSES IN THE ENTIRE STATE - AVERAGING NEARLY 6 GOALS PER GAME. MELISSA FOX'S 26TH GOAL OF THE YEAR, WITH 29:40 REMAINING BECAME THE FIRST TIME ALL YEAR CHAGRIN FALLS TRAILED IN A MATCH. JENNIFER BARR ASSISTED MICHELLE ROND'S GOAL, TO MAKE IT 2-0, WHICH SEALED THE VICTORY FOR THE STALLIONS. GAME NOTES: SOPHOMORE GOALKEEPER MINDY HAMMOND'S PENALTY KICK IN THE SHOOTOUT, COUPLED WITH A KEY STOP IN GOAL ON A PK ATTEMPT BY BADIN’S ERIN KRAFT, LED THE STALLIONS TO THE PROGRAM'S FIRST-EVER STATE TITLE. We encourage team members, parents, alumni and/or fans to share their photos or favorite memories about the 1995 DeSales Girls Soccer team. Click on the button below to submit your favorite memory! 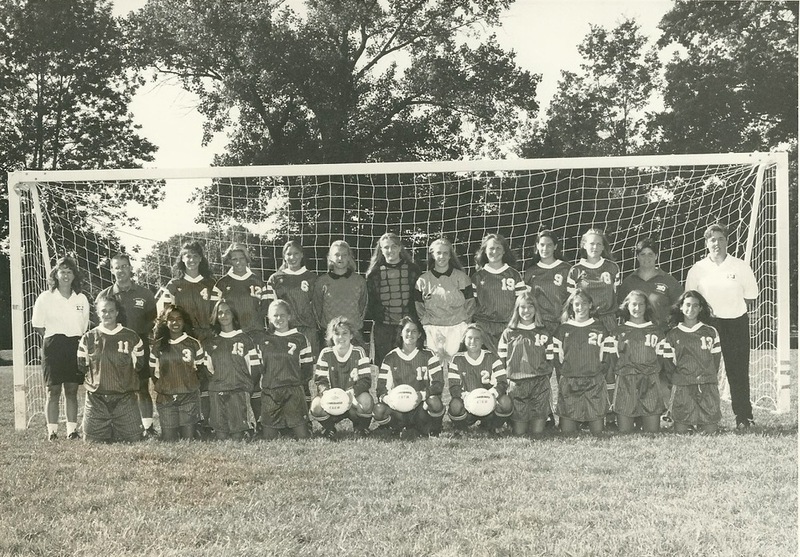 Submit your favorite memory of the 1995 girls soccer team!